We kid you not: Solutions for the ambitious project to send humans to Mars have been inspired by the design of a child’s toy. 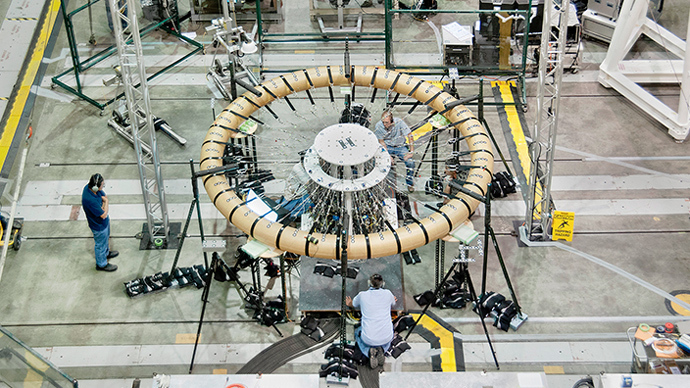 NASA is testing an inflatable heat shield based on the idea of a stacking ring of donuts. To solve the complex problem of astronauts landing on Mars, engineers at NASA's Langley Research Center have resorted to a simple, yet inspiring measure – they recalled their childhood. The new technology they have come up with looks a lot like a super-sized version of a stacking ring of donuts, AP reported Saturday. Experts believe that a lightweight, inflatable heat shield could be deployed to slow down the aircraft, while entering the Martian atmosphere. It is about a hundred times thinner than the Earth’s, so parachutes won’t work. But rockets alone can’t be used, like on the atmosphereless moon. "We try to not use propulsion if we don't have to," said Neil Cheatwood, senior engineer at Langley for advanced entry, descent and landing systems. "We make use of that atmosphere as much as we can, because it means we don't have to carry all that fuel with us." The landing technology supposes that the rings, covered with a thermal blanket of layers of heat-resistant materials, would be filled with nitrogen. After the deployment they would head the spacecraft – like a top of a gigantic mushroom. As the inflatables are made of lightweight materials and filled with gas, they leave more space inside a spacecraft. Current heat shield technology only allows rockets to take rovers to Mars. "The idea is that you would have something that could be packed up, put in a very small volume and then deployed into a very large size," Anthony Calomino, principal investigator for materials and structures for hypersonic re-entry at Langley said in a statement. The second-generation technology is set to be tested in year 2016, when the inflatables will be first launched into orbit on the next Antares rocket. NASA scientists say a manned mission to the Red Planet could take place as early as the 2030s. "When you first tell people you're going to do an ... inflatable spacecraft, they have in their minds something really floppy like a jellyfish and it's really not that way,"Cheatwood said. "They're very durable ... This is a technology that I think is ready to use, whether it's for humans in 20 years on Mars or whether it's a large robotic mission sooner than that."